“Should I start with the walls or the cabinets?” “Will our investment in remodeling be worth it if we decide to sell?” Don’t miss the chance to improve your kitchen, the center of your home. Eighty percent of all entertainment happens in the kitchen. Painting cabinets, costs far less than outright replacement. Bargain-basement cabinets for a 10×12-ft. kitchen can easily top $5,000, not including the cost of installation or new counters, and your new cabinets may be of lower quality than the ones you’re getting rid of. Refacing cabinets, a process of veneering existing cabinet boxes and replacing doors and drawer fronts, is another option, but a top-notch refacing job starts at $8,500. Lately the prices of re-painting has been a 3rd of the cost to re-facing. Painting cabinets allows the customer to be creative with stencils, aging and distressing, wax or varnish, colors, images, the list goes on. Plus you would also have the ability to add architectural features to the cabinets like, trim, dental molding, extend the cabinets to the ceiling, and crown molding. Kitchen cabinet overhaul- River Creek VA.
“We hired John to paint our cabinets after we saw his work at a friend’s house. 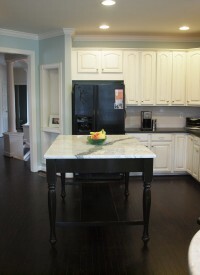 John re-designed our entire kitchen and took the time to accompany us to pick out the marble countertop! He really put 100% into our job and he was very affordable!”- Chad & Kim Hardnell, River Creek, VA.
Hand painted kitchen island(detail) River Creek VA. Kitchen cabinet overhaul River Creek VA.
Hand painted kitchen cabinets River Creek VA.
Before pictures – Brookside VA.
(After)Painted kitchen cabinets- Brrokside VA.
Black kitchen cabinets- Leesburg VA.